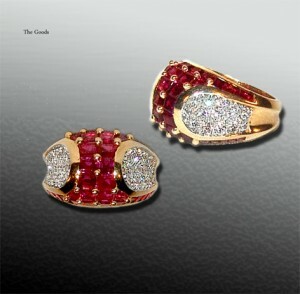 A stunning design and Master Crafted by Oscar Heyman, "The Jewellers Jeweller". Perfection in design with perfectly matched rubies and brilliant white diamonds in a unique saddle back shape. The only jewellery company today that still makes jewellery from the design up, smelting their own precious metals, cutting the gem stones to perfection and hand crafting every piece.